You can help our charity with your vehicle donation. Running or not, we can have your car, boat or RV picked up in all 50 states! Click here to donate your vehicle to the Nichi Bei Foundation! Buying a new car? Getting rid of an old one? Selling isn’t your only option. We’ve teamed up with Donate for Charity to make donating your car, boat or RV easy. 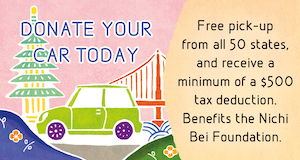 It’s a win for all: You get a minimum $500 tax deduction (or higher, depending on what your car sells for), and Nichi Bei Foundation receives the net proceeds to support our program. Money from vehicle donations provide much-needed funds. Avoid the anxiety and hassle of selling to a private party. 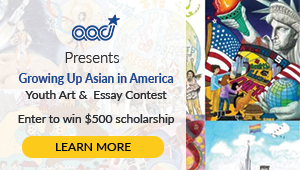 Proceeds will go to Nichi Bei Foundation. By donating your car, boat or RV, you’ll avoid the headache of selling a used vehicle. Whether the vehicle is running or not, Donate For Charity can help process the donation. 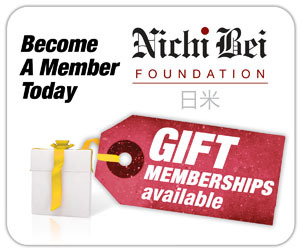 Thank you for considering supporting the Nichi Bei Foundation!